A ground-breaking new paper putting climate models to the test yields an unexpected result – steps and pauses in the climate signal | Watts Up With That? A ground-breaking new paper has recently been published in Earth System Dynamics that really turns the idea of direct linear warming of the atmosphere on it’s ear, suggesting a “store and release mechanism” by the oceans, which explains why there seemed to be a shift in global temperature during the 1997/98 super El Nino followed by a “pause” in global temperatures. Remember the “escalator” graph from wrongly named “Skeptcal Science” designed to shame climate skeptics? Looks like that may have been an accidentally prescient backfire on their part based on the findings of this new paper. The paper is: “Reconciling the signal and noise of atmospheric warming on decadal timescales“, Roger N. Jones and James H. Ricketts, Earth System Dynamics, 8 (1), 2017. “The multistep bivariate test is used to detect step changes in temperature data. The resulting data are then subject to six tests designed to distinguish between the two statistical hypotheses, hstep and htrend. Test 1: since the mid-20th century, most observed warming has taken place in four events: in 1979/80 and 1997/98 at the global scale, 1988/89 in the Northern Hemisphere and 1968–70 in the Southern Hemisphere. Temperature is more step-like than trend-like on a regional basis. Satellite temperature is more step-like than surface temperature. Warming from internal trends is less than 40 % of the total for four of five global records tested (1880–2013/14). If climate changes in a stepwise manner, it would be expected that other variables would show signs of this (Test 5). Instances of step changes in the literature are widespread, and are mentioned elsewhere in this paper (e.g. Table 6). For rainfall, notable examples are a step change in the Sahel in 1970 (L’Hôte et al., 2002; Mahé and Paturel, 2009), south-west Western Australia (WA) in the late 1960s and early 1970s (Li et al., 2005; Power et al., 2005; Hope et al., 2010) and the western US in the 1930s (Narisma et al., 2007). Similar changes have been detected in streamflow records worldwide, showing that regime changes in moisture have been a long-standing aspect of climate variability (Whetton et al., 1990). A few more recent changes have been directly attributed to increasing gases, although south-west WA is an exception (Cai and Cowan, 2006; Timbal et al., 2006; Delworth and Zeng, 2014), with large-scale shifts in synoptic types accompanying a rapid decrease in rainfall (Hope et al., 2006). The bivariate test identifies a step change in southwest WA winter rainfall in 1969 (shown in Fig. 6a), with an upward step in summer rainfall in northern Australia 1 year later. 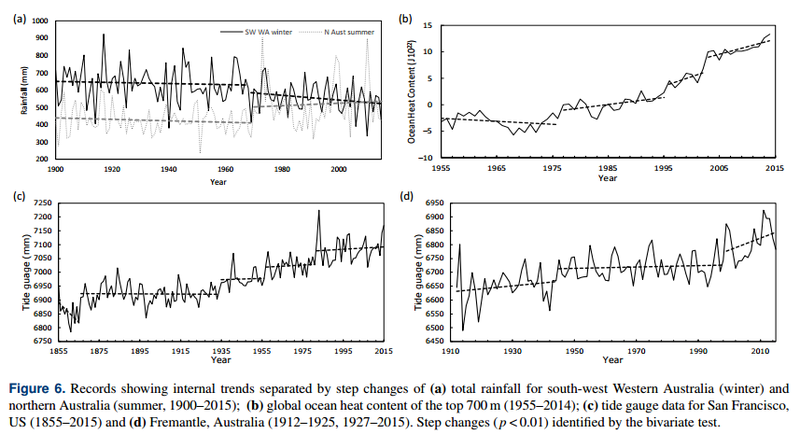 Ocean heat content of the upper ocean also shows step changes occurring in 1977, 1996 and 2003 (Fig. 6b). Changes in long-run tide gauge records also show a stepladder-like process of sea level rise, with the San Francisco record, quality controlled and dating back to 1855, being a good example; it shows step changes in 1866, 1935, 1957 and 1982 (Fig. 6c). Step changes in the Fremantle tide gauge data records, one of the longest in the Southern Hemisphere, shows that most of the decline in the average return intervals of extreme events noted by Church et al. (2006) before and after 1950 occurred in two events (Fig. 6d) in the late 1940s and the late 1990s. This variation in rise was noted by White et al. (2014). None of the internal trends in Fig. 6a–d attain p < 0.05, showing the dynamic nature of change and limited trend-like behaviour in these examples. 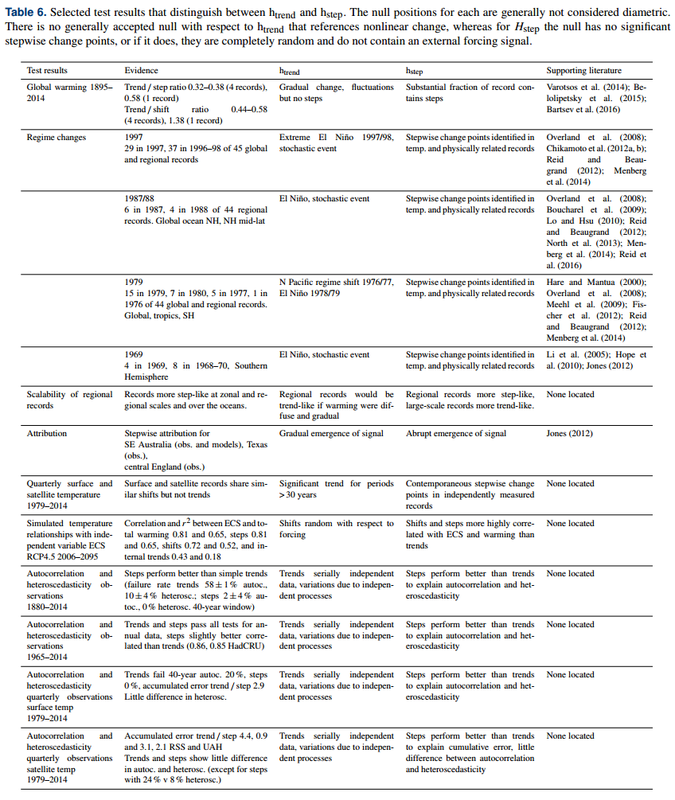 Table 6 summarises the major tests undertaken with expected outcomes for htrend and hstep. While objections could be made to each of these on an individual basis, collectively they show that for externally forced warming on decadal scales, hstep is better supported than htrend. In summary, these tests show that hstep is a close approximation of the data when analysing decadal-scale warming. Over the long term, this warming conforms to a complex trend that can be simplified as a monotonic curve, but the actual pathway is step-like. As outlined in Sect. 3.3, this rules out gradual warming, either in situ in the atmosphere or as a gradual release from the ocean, in favour of a more abrupt process of storage and release. This conclusion supports the substantive hypothesis H2 over H1, where the climate change and variability interact, rather than varying independently. Proposed mechanisms for step-like warming The correlation between step-like warming and ECS in the models, between the timing of steps in model hindcasts and observations and between steps and known regime changes in observations (Table 6), provides strong evidence that warming is non-gradual on decadal timescales. The high correlations of steps and shifts with model ECS indicate that atmospheric feedback processes respond to abrupt releases of heat into the atmosphere. The presence of negligible internal trends occurring over some oceanic regions, the region 30– 60◦ N, and in tropospheric satellite temperatures, suggests that little of the heat being trapped in the atmosphere by anthropogenic greenhouse gases actually remains there. One justification given for rejecting externally driven steplike warming is that it is presumed that there is no plausible physical mechanism for this (Cahill et al., 2015; Foster and Abraham, 2015). However, to suggest that the stepwise release of heat energy is physically implausible overlooks the energetics of the ocean–atmosphere system. Hydrodynamic processes are quite capable of supplying the energy required (Ozawa et al., 2003; Lucarini and Ragone, 2011; Ghil, 2012). The atmosphere contains as much heat energy as the top 3.2 m of ocean (Bureau of Meteorology, 2003). About 93 % of historically added heat currently resides in the ocean (Levitus et al., 2012; Roemmich et al., 2015), whereas the atmosphere contains about 3 % of the total. A similar amount of the heat has been stored within the land mass (Balmaseda et al., 2013) and on an annual basis a similar flux is absorbed in melting ice (Hansen et al., 2011). A physical reorganisation of the ocean–atmosphere system, as part of a regime change, is therefore large enough to provide the relatively small amount of energy required to cause abrupt sea surface and atmospheric warming (Roemmich et al., 2015; Reid et al., 2016), as shown by rapid changes in shallow ocean heat content (Fig. 6b; Roemmich and Gilson, 2011; Reid, 2016). For example, Reid et al. (2016) in describing the late 1980s regime change, show it was associated with large-scale shifts in temperature and multiple impacts across terrestrial and marine systems, mainly in the Northern Hemisphere. Changes in the North Pacific in 1977 were considered even more extensive (Hare and Mantua, 2000), as were those in 1997/98 involving both the Pacific and Atlantic oceans (Chikamoto et al., 2012a, b). In developing tests for detection and attribution, Jones (2012) noted two types of regime change over land: one where codependent variables such as maximum temperature and rainfall undergo a step change but remain in a stationary relationship, and the other, nonstationary change, where warming undergoes a step change independent of rainfall change. This suggests that although regime changes are a normal part of internal climate variability, they can be enhanced, releasing extra heat. The step changes summarised in Table 6 coincide with El Niño events but the heat emitted by other El Niño events dissipates and is absorbed back into the ocean within months; thus, an added mechanism is required. We propose that there is negligible in situ atmospheric warming and that almost all of the added heat trapped by anthropogenic greenhouse gases is absorbed by and stored in the ocean. It is subsequently released through the action of oscillatory mechanisms associated with regime shifts. Most heat (long-wave radiation) is trapped near the ground or ocean surface and much of that is radiated downwards (Trenberth, 2011). The atmosphere as a whole has little intrinsic heat memory and does not warm independently of the surface. This is supported by observations on land where the overpassing air mass takes on the characteristics of the underlying surface, achieving energy balance within a 300 m distance (Morton, 1983). When passing from land to water, this will see all of the available heat energy taken up by water if the temperature of the air mass exceeds that of water (Morton, 1983, 1986), with the temperature of the overpassing air mass reaching equilibrium with the water beneath within a very short time. Very little of the heat trapped over land can be absorbed by the land surface, but will be transported from land to ocean within a few days to a few weeks, where it can be absorbed (the high latitudes being an exception). Given that the atmosphere interacts with the top 70 m of ocean over an annual cycle (Hartmann, 1994), there is ample opportunity for the majority of available heat trapped over land that is not absorbed by land, lakes and ice to be absorbed by the ocean. Our conclusion that the atmosphere does not warm in situ will challenge many who consider that to be a basic part of the greenhouse effect. However, an exhaustive search of the literature failed to find any direct evidence that this actually takes place. We find it hard to perceive how an additional increment of long-wave radiation on the order of ∼ 0.2 Wm−2 (direct forcing and feedback derived from Schmidt et al. 2010) can behave differently to the ∼ 155 Wm−2 produced in the atmosphere year to year without being absorbed by the wider climate system. Given that climate models exhibit step-like warming, where the abrupt component carries the greater part of the signal than internal trends, they produce emergent behaviour that is not identified by mainstream analytic approaches. Overwhelmingly, model- and statistically based studies represent the global warming signal as changing gradually. Some are prescriptive because of their structure or because they apply simplified assumptions about a more complex climate system, other models examine a small part of the system, and some have a historical legacy bestowing familiarity and reliability. Modern climate models are almost as complex as the climate, and thus need to be understood through simpler models (Held, 2005; Benestad, 2016), forming a nested modelling approach from simple through to complex (Schneider and Dickinson, 1974; Ghil, 2015). The linking of trend analysis methods with gradual change may overlook the distinction between process-based and diagnostic models. A diagnostic model may identify a trend without necessarily indicating a gradual process. A large part of the climate wars has been fought over this very point. Nonlinear responses in climate are being investigated by researchers, with an interest in complex system behaviour via dynamical systems and related theory. Our conclusions suggest that the processes of radiative transfer and subsequent warming take place in two separate domains of the climate system, separated by a delay. The absorption of radiation is a linear process that is quite separate from the behaviour of turbulent dissipation of heat energy within the climate system, which is fundamentally nonlinear (Ozawa et al., 2003). Developments based on deterministic nonlinear and stochastic linear behaviour originating from work by Lorenz (1963) and Hasselmann (1976) respectively explore a range of interrelated phenomena, such as non-equilibrium stable states, oscillators, strange attractors, bifurcations and entropy production, in order to develop a unified theory of climate (Ozawa et al., 2003; Lucarini et al., 2014; Franzke et al., 2015; Ghil, 2015). Studying how the free and forced aspects of change combine to alter the statistical properties of climate is a specific goal (Lucarini and Sarno, 2011; Ghil, 2012, 2015). Our focus is on understanding the role of linear and nonlinear behaviour in changing climate risk over decadal timescales, specifically how initial condition and boundarylimited uncertainties (as described by Lorenz, 1975 and Hasselmann, 2002) combine. Initial-condition uncertainty is boundary limited, varying within a certain amplitude, with the outcome depending on the pathway taken within those limits (Lorenz, 1975). There is also a time-dependent window that serves as a predictability barrier. Changing boundary conditions are intransitive, with the outcome being insensitive to initial conditions. 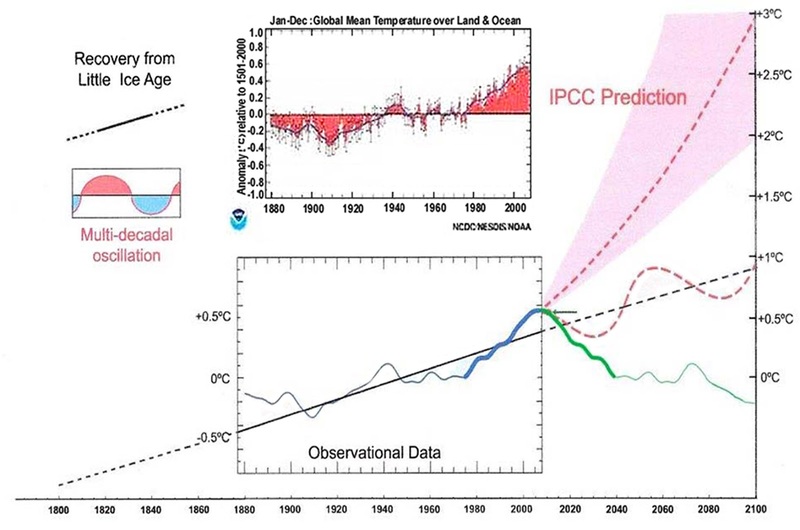 The nested nature of climate phenomena over different timescales results in decadalscale climates being both an initial-condition and intransitive process, combining to produce stochastically driven step changes in warming that integrate into a long-term complex trend. The coincident timing of step changes in both observations and models (Fig. 7) suggests that other factors, such as short-term volcanic forcing, can also influence the timing of step changes. Lorenz (1968) referred to the outcome of forced climate change on century timescales as almost intransitive. The “almost” is due to initial condition uncertainties operating within the boundary limitations of decadal variability. The almost-intransitive model (Lorenz, 1968) is described via linear response theory (Lucarini et al., 2014; Ragone et al., 2016) and shown to be robust for concepts such as effective radiative forcing (Hansen et al., 2005) and effective climate sensitivity (Andrews et al., 2015), although these phenomena would be sensitive to bifurcations if they were to occur (Hasselmann, 2002). This is the first paper I’ve ever read that ties together models, observations, and chaos theory of the atmosphere from Lorenz. It makes many excellent points, and it will be interesting to see if those at the top of the climate science food chain like Mann, Trenberth, and Schmidt accept these new ideas, or dismiss them and call anyone who believes them “linear trend deniers“. Besides these new findings, what is refreshing is that the paper had open peer review, with both editor and reviewer comments published here. The final revised paper is available here. Well worth a read! I look forward to seeing the reactions. And, they published data and code! Code is included with the Supplement as a zip file (Python and R modules). Data availability. Included with the Supplement as Excel files. h/t to Larry Kummer of Fabius Maximus who has a long list of papers on the subject of testing models (with links) at the end of this post. March 31, 2017 in Climate Models, Climate sensitivity. My economics teacher once told me to “beware of linear graphs”. Yet again another inconvenient fact. Just how many inconvenient facts will it take to bust this climate bubble ? Thanks, fhhaynie, just what I was going to say – but you put it more neatly. Well that first graph has NO error bars on it anywhere, so one can conclude that the ” noise ” content is ZERO. The rest of it IS the SIGNAL. Well the PLOTTED DOTS are the signal. The (stupid) silly straight lines joining the dots are total rubbish. Fraud, would be a more charitable term. I’m quite prepared to accept the dots as credible observations of whatever was being observed. But the Rube Goldberg attempt to reconstruct the original continuous function from the sampled data points, is completely invalid; there is no acceptance of such a reconstruction algorithm, as a valid reconstruction. On the other hand, a simple horizontal ” HOLD ” during each inter-sample period, IS a very common and quite acceptable reconstitution, of a sampled continuous function from its instantaneous sampled values. A quite simple low pass filtering of the hold stepped graph will be a quite acceptable reconstruction for most applications. Besides that, it is contrary to the physical reality. The ” HEAT ” (noun) is NOT trapped by ” anthropogenic greenhouse gases “. That heat is distributed among all of the atmospheric molecules according to the equi-partition principle of thermo-dynamics, and then it is conveyed upwards as a result of ordinary convection. It certainly does not flow downwards, from the colder layers of the atmosphere to the warmer layers, in contravention of the second law. Somebody needs to inform the authors that greenhouse gases are supposed to ” trap ” LWIR Electromagnetic Radiation Energy; which is an entirely different form of energy, from ” HEAT ” energy. Please describe an example of ” oscillatory mechanisms associated with regime shifts. ” and also a sample ” regime shift “. Punctuated Equalibrium in the climate. No surprise there. Nearly 8-years ago, I postulated step-wise changes in climate in response to a then recently publish paper by National Center for Atmospheric Research [NCAR]. Punctuated Equalibrium: Warming by jerks. Lol. Sorry a little Gould reference. Climate change science is no longer about science. It is about defending prepared positions and losing face. Well said DG, quite accurate in fact. Here in Ontario the situation is mired in muck. Our educated and political class are committed to the AGW alarmist narrative. It’s as if the date to submit evidence against it has come and gone, and the issue now is how best to deal with the imagined problems. My guess is they have no idea of how the Enhanced Greenhouse Effect actually works and are completely unaware of the uncertainties surrounding the phenomenon’s influence. These people have spent a great deal of taxpayer money attempting by example to make Ontario a world leader in the fight against Anthropogenic Global Warming. Over ten years ago the province implemented the Green Energy Act with the intent to control greenhouse gases from fossil fuel emissions and reduce the impact of AGW. The act enabled them to replace coal fired power (at the time one third of base load generation) with unreliable wind and solar powered generation. Since then “peak” power rates have tripled. The unnecessary cost of refurbishing old nukes, the wind/solar investment coupled with the cost of gas powered back-up, the unloading of excess “alternative” power to competing jurisdictions along with the interest on the increased debt is easily over $50 billion and growing. So yeah, there is no way any of them can or will admit to being wrong. They need and will soon be trying to find a graceful exit….IMHO there isn’t one, it’s a train wreck. I thought the oceans heating the atmosphere was settled, seemed obvious. Looks like a good paper. May be a spelling error: Looks like that may have been an accidentally prescient backfire of their part based on the findings of this new paper. …Dang !! Beat me to it !! Great post otherwise….. I like the simplicity of how Joe Bastardi says it (I’m paraphrasing): When you’re in the shower, it’s the water that warms the room, not the light. Yup, I think everybody at Weatherbell will be pleased with these findings. This paper IMO seems to sum up what Joe has been saying. This statement makes intuitive sense, but it begs the question of how much heat they believe is added by anthropogenic greenhouse gases, compared to natural GHGs. Is that addressed somewhere in the paper? If not, no big deal – the paper is an interesting discussion of step changes and can’t be expected to cover every aspect of the climate change debate. It is not intuitive to me. CAGW THEORY demands the warming takes place in the atmosphere, specifically the troposphere overall at a rate 20 percent greater then the surface, and more for the tropics. LWIR can only directly accelerate the hydrological cycle. The mechanism for deep ocean warming via LWIR is not clear at best, and dependent on atmospheric warming AFAICT. The atmosphere as a whole has little intrinsic heat memory and does not warm independently of the surface. On the other hand … the atmosphere is transparent at the wavelengths where the sun has the most energy so I guess it’s reasonable that the sun warms the surface more than it warms the atmosphere. Even if the surface has more intrinsic heat memory than the atmosphere, the atmosphere is a lot more mobile and moves a lot of heat around. Yes, but only after being warmed by the surface (conduction and convection, not radiation). From a pure physics standpoint, the specific heat capacity of water (4.19 KJ/Kg K) is far larger than that of dry air (whose specific heat capacity varies with temperature but at normal environmental temps, it is around 1.0 KJ/Kg K). And the mass of the oceans is also several hundred times the mass of the earth’s atmosphere. So without regard to circulation, the earth’s oceans are vastly more capable of storing or releasing heat energy with relatively minor changes in seawater temperature as compared to the earth’s atmosphere. So yes, it is pretty intuitive that the the oceans affect the temperature of the air far more than the air affects the temperature of the oceans. DY, the statement is nonsense for three reasons. 1. Oceans are warmed by visible sunlight, which can penetrate to depth. 2. Oceans cannot be warmed by backscattered (downwelling) IR, because is can only penetrate a few microns and only results in slightly enhanced surface evaporation, which cools the ocean surface by carrying off water vapors latent heat of evaporation into the atmosphere. 3. The GHE is an absence of sufficient radiative cooling. Also UV. In fact, about half of the light penetrating the photic zone is UV and the rest visible. UV fluctuates much more widely than TSI, so has an out-sized impact on climatic effects, both directly and via ozone generation. Perhaps; The GHE is a diminution (or retardation) of radiative cooling ? Ristvan….how does backscattering ever reach the ground????. it doesn’t. I don’t understand what would stop some amount of “scattered” radiation from reaching the ground . . just as some ( I would think) reaches any part of the atmosphere . . Please explain. Their statement is rubbish ! Greenhouse gases have nothing whatsoever to do with the trapping of heat. Their purported physical effect is the temporary interception of LWIR surface emitted Electromagnetic Radiation energy. Heat in the atmosphere, from whatever source, is distributed according to the equi-partition principle. On average, each molecule regardless of species has exactly the same kinetic energy (heat) at any specific atmospheric (local) Temperature. GHGs have no special role in that. It makes as much sense to me as the ramblings of a mad man. By what mechanism is ‘added heat trapped by anthropogenic greenhouse gases’ absorbed by and stored in the ocean? The climate mechanisms I know of: LWIR radiation emission, evaporative cooling, convection – all have heat moving further from the surface. Further: heat is not trapped by GHG. The escape of heat to space is, in theory, slowed by GHG. They implicitly tie anthropogenic warming to ocean heat content but do not quantify either the input or output. 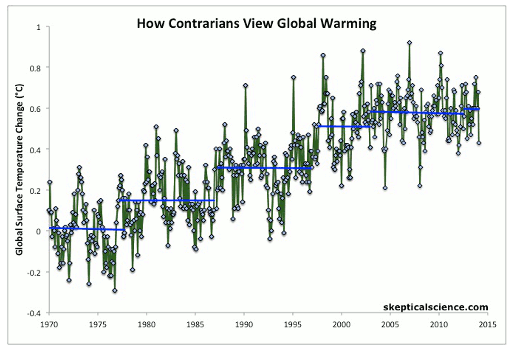 It’s a semi-genuflection to AGW pseudo science, but hedges their bet. If this study is correct than the warming observed this far has nothing to do with the anthropogenic forcing assumed…. And if this is correct, I can not even begin to consider the complication with the Mr. Stokes step up warming implied….a year or so ago…. A global warming can not be by default considered as an AGW simply because we earthlings have become over aware, oversensitive and overreacting to our affairs and our “emissions” of some “pollutant”……..
What about sea floor vulcanoes? They may cause stepwise changes. They must have discovered the buried homogenization/adjustment footprints in the data. The release of stored ocean heat in “bursts” seems logical to me especially when it ties in with natural phenomena like El Nino. But surely AGW by CO2 isn’t an obligatory requirement for this effect…..it should happen with increases in insolation regardless of CO2 levels…..or am I missing something here? That’s what I was thinking as well. The periodic capture and release of ocean heat into the atmosphere sounds a lot like ENSO. Has anybody quantified the effect of LWIR on ocean heat content? You mention “natural phenomena like El Nino”. El Ninos are NOT natural phenomena. They are ALWAYS preceded by a decrease in anthropogenic SO2 aerosol emissions (which increases surface warming), either due to the reduction in SO2 emissions during a business recession, or due to Clean Air efforts. For proof of this, Google “Climate Change Deciphered”, and see my preprint “The Cause and Timings of El Nino Events” at OSF.io. Sorry, Burl, but El Nino’s ARE natural phenomena. Even if the SO2 emissions did indeed decrease, it doesn’t explain any increases in areas that do not have any emissions of those pollutants. AVERAGE global temperatures increase whenever there is a business recession, so any local temperature differences due to differing SO2 emission levels are averaged in. Until about 1970 , EVERY El Nino was coincident with a business recession. (with a month or two of lag while ENSO temperatures increased enough to trigger an El Nino). Since then, there have been El Ninos not associated with a business recession, due to Clean Air Act reductions in SO2 emissions. It is inescapable, El Ninos are NOT natural events. They are ALL are man made. Do you not realize where the name “el Nino” came from? It was the name given by the early Spanish colonial fishermen in South America, so given because it regularly showed up around Christmas time, and refers to the Christ Child or “el nino”. It never had anything to do with business recessions, which in any case do not effect coal usage anyway. Electrical power generation climbs continuously irrespective of the business cycle. 1. You need to Google “Climate Change Deciphered”. The included temperature anomaly graphs of GISS and Hadcrut4 show multiple temporary increases in average global temperatures, going back to 1880 for GISS, and 1850 fior Hadcrut4. 2. Since 1850, there have been 2 depressions and 29 recessions. ALL coincide with the temporary increases in average global temperatures.during a business slowdown, due to reduced SO2 emissions.because of lessened industrial activity. 3. Regar4dless of the historical connotations, all El Ninos since 1850 precisely reflect decreases in global atmospheric SO2 aerosol levels. Since no previous climate model incorporated stepwise functions and no previous model has tracked observation it is safe to conclude that all previous climate models are wrong. Watch the scramble as modellers try to graft on these new techniques. Keep in mind you don’t fix a model by back fitting and the new improved “this time for sure!” Predictions will be coming from the same people who got it wrong in the first place. No doubt a great number of the models will also come with a “it’s worse than we’re thought” scenario. So we have devolved to point where cycles are now steps and pauses? This raises another interesting question. Much effort has been made to “adjust” temperature records so that observations become more linear to match CO2 records. I would assume that this would mask these step changes and thus make the adjusted data unfit for analysis of this concept. Bob Tisdale’s step graphs tweaked my interest years ago. I like this paper in that it raises some badly needed new thinking about climate change during intermediate time frames. We don’t have actual data far enough back to really identify intermediate changes like this (e.g.. smoothed proxies would hide steps), and, frankly, I am tired of the current use of weather events as illustrative of anything climatic. Except that IR longwave radiation does not heat the oceans beyond the first mm or so, resulting in increased evaporation. Any additional heat in the atmosphere comes from the oceans, and is transported to the poles for dissipation into space. The stepwise pattern shows the oceans heating the air, not the other way around. And the warming in recent decades results in a diminished temperature gradient between the equator and poles. Thanks Richard. My bad to overstate the penetration of LWR by a factor of 1000. Well you have to be careful not to overdo it. Seawater has its absolute maximum absorption coefficient at 3.0 microns; which is not normally considered ” long wave ” , because there is still some solar spectrum radiation at 3.0 microns. The black body radiator most closely approaching the sun, spectrally, still has 1% of its power left at wavelengths longer than 4.0 microns, so somewhere between 1 and 2% at 3 microns and longer. The LWIR spectrum corresponding to a BB Temperature of 288 K, the global mean surface Temperature, peaks at 10.1 microns, so 99% of that LWIR spectrum power is at wavelengths of 5.05 microns and longer (longer than half of the peak wavelength), so 5 to 80 microns is considered the principal climate affecting LWIR. So back at the 3.0 micron water absorption peak. The absorption coefficient is about 8,000 cm-1, which means the 1/e absorption depth is just 1.25 microns, so 99% of that radiation is absorbed in 6.25 microns of sea water. BUT ! for the bulk of the LWIR spectrum, away from 3.0 microns, the absorption coefficient is more typically in the range of 100 to 1,000 cm^-1, 99% of all of the LWIR spectrum is absorbed in about 50 to 500 microns of sea water, and it’s closer to the thinner end than the thicker, so even 0.5 mm is going to kill it all. That to me is still thin enough to say that the depth penetration is negligible. And as a result of the evaporative process carrying off the more energetic high energy tail of the Maxwell Boltzmann distribution of molecular energies, the very surface of the water is deficient in high energy molecules, so it has a lower effective Temperature than water further from the surface. Consequently the water near the surface has an inverted Temperature gradient, and warms up as you penetrate further from the surface (probably for several mm to cm distance. So there is a Temperature gradient that is driving HEAT (noun) from the bulk water towards the surface; well it has to, to replenish the long M-B tail molecule energies that was lost to evaporating molecules. So I believe it is Total BS that downward LWIR absorption in the ocean surface ” skin ” is propagated to the ocean depths to contribute to ocean heat content. On the other hand, at the roughly 500 nm peak wavelength of the solar spectrum, where the maximum solar spectrum energy is concentrated, the sea water absorption coefficient is about 1E-4 cm^-1 so now the 1/e absorption depth is 10^4 cm or 100 meters, and the 99% absorption depth is 500 meters. The solar spectrum RADIANT energy is deposited way down in the ocean, where eventually either the water, or some biological presence, captures it, and converts it to HEAT (noun). One can argue that the sunlight (energy) that lands in the ocean today, is nowhere to be found, tomorrow. Well we know it is there down maybe some 200 meters deep, and it will take its merry time before making it back to the surface to affect the weather. This is just one more example of how the molecular properties of the H2O molecule with its 104 degree bend in it, makes life possible, and also controls our climate. Water is the damndest thing that Mother Gaia ever conjured up !! Thanks Ron. This was my reaction as well. Although this paper sounds nice, tying in obvious observations to models…it reads to me as a poor attempt to subvert physics to the cult of climate change. To claim that, “almost all of the added heat trapped by anthropogenic greenhouse gases is absorbed by and stored in the ocean,” is profoundly silly. Furthermore, the specious claim that, “Most heat (long-wave radiation) is trapped near the ground or ocean surface and much of that is radiated downwards (Trenberth, 2011),” reveals (again, to me) that the authors are more concerned with finding “missing heat” than engaging in serious science. So, sorry, the nod to chaos theory notwithstanding, this paper fails to advance anything except a clear agenda to support manmade GW. The argument is that the heating of the top few microns will increase evaporation but will also lessen the temperature differential between the cool top layer and the warmer layer underneath, slowing down the rate of cooling of the warmer layer. It would be nice to see this demonstrated and measured in some type of controlled experiment. Does anybody know if this has been done? Eric, thanks for explaining that notion. I don’t know of a controlled experiment, but I have seen empirical measures of the ocean-air interface that show SST warming resulting from incoming SW solar radiation, and SST cooling from evaporation. These factors overwhelm any possible effects from DWIR, IMO. Ron, You may be right and you are in good company. IF LWIR is incapable of heating the ocean it would seem the “CO2 is causing warming” argument is lost. Now to figure out an experiment to prove one way or another. Interesting stuff. Since the cooler ocean skin is due to evaporation taking heat away from the surface faster than it can come up from below or be supplied from above it must follow that more evaporation makes the skin layer even cooler, not warmer. Evaporation is a net cooling process (the phase change requires 5 times as much energy as is required to induce it at 1 bar atmospheric pressure) so if more DWIR into the skin provokes more evaporation (as it must unless one increases atmospheric pressure) then any additional DWIR must make the ocean skin colder rather than warmer. As the atmosphere cannot warm the oceans deeper than a tiny depth, sometimes referred to as the skin layer, it seems consistent to say the oceans cannot cool warmer air parcels. The IR sees the wall built by water at the surface and says can’t go there. It then rather than hang around, heads right for the TOA, and that’s how the air parcel cools. It doesn’t do that over land. It just stays warm. “When air in contact with the ocean is at a different temperature than that of the sea surface, heat transfer by conduction takes place. On average the ocean is about 1 or 2 degrees warmer than the atmosphere so on average ocean heat is transferred from ocean to atmosphere by conduction. That CO2 cannot warm oceans would seem to align with water vapor not being able to warm oceans. The above quote would give us ocean circulations. Warm water that stays warm because of GHGs until it gets to a place with less GHGs such as the poles with their lower humidity levels. GHGs would then be an engine, a throttle of ocean circulations. If ocean water did not have this storage capacity influenced by atmospheric insulation driving it to the poles, then what? Ragnaar, You left out the last sentence in the quote: “Net back radiation cools the ocean, on a global average by 66 watts per square meter.” Even the “back radiation”, mostly from H2O, doesn’t stop massive energy loss from the ocean to the air. Overlay a bunch of cycles of different wavelengths and you’ll get steps. So you need complex models that no-one understands to explain why other complex models that no-one understands are wrong. And you need simple models to try to understand it all. I call BS! The Swiss have just announced that their revised models including the newly introduced effect of that big ball in the sky show that it could well get colder over the next century. I am shocked I tell you that someone thinks the sun affects how warm or cold we are on Earth. Goodness, these scientific people really must be clever! If only their solar power systems could generate enough heat to burn a few of these heretics at the stake. Then the Mother Church of AGW would be safe! The step changes summarised in Table 6 coincide with El Niño events but the heat emitted by other El Niño events dissipates and is absorbed back into the ocean within months; thus, an added mechanism is required. We propose that there is negligible in situ atmospheric warming and that almost all of the added heat trapped by anthropogenic greenhouse gases is absorbed by and stored in the ocean. It is subsequently released through the action of oscillatory mechanisms associated with regime shifts. Most heat (long-wave radiation) is trapped near the ground or ocean surface and much of that is radiated downwards (Trenberth, 2011). The atmosphere as a whole has little intrinsic heat memory and does not warm independently of the surface. This is supported by observations on land where the overpassing air mass takes on the characteristics of the underlying surface, achieving energy balance within a 300 m distance (Morton, 1983). When passing from land to water, this will see all of the available heat energy taken up by water if the temperature of the air mass exceeds that of water (Morton, 1983, 1986), with the temperature of the overpassing air mass reaching equilibrium with the water beneath within a very short time. Very little of the heat trapped over land can be absorbed by the land surface, but will be transported from land to ocean within a few days to a few weeks, where it can be absorbed (the high latitudes being an exception. Has anyone ever tried to measured in temperature increase of ocean surface waters following a warm breeze? Doesn’t evaporation place a heavy burden on the heat budget if you try to heat cold water with a flow of warm air over the surface layer? Isn’t some evaporation incompatible with “all of the available heat energy” being “taken up by the water”? Or is evaporation counted in “heat taken up” (into the sky to form clouds) “by the water”? How off Earth does heat ever manage to escape, in their model? I like the cloud hypothesis. Less low level clouds allow more SWIR into the ocean and more low level clouds allow less SWIR to enter the oceans. ENSO is related to the strength of the trade winds but looks like a negative feedback to ocean heating. Maybe one of the more knowledgeable posters can add or correct me on this. Don’t — be — fooled. This is just more JUNK SCIENCE to support the conjecture about AGW. added heat trapped by anthropogenic greenhouse gases is absorbed by and stored in the ocean. There is no evidence of any heat being trapped by human CO2 (or other) emissions. None. Thus, this statement is a lie. This is most certainly not a serious and credible statement. NO causation has been proven between human CO2 (or other) emissions and atmospheric or ocean warming. That lovely looking cake is full of small but deadly (to truth and, thus, freedom) worms. I agree with you Janice, 100%. I also caught that line about the climate models being “almost” as complex as the climate. Hogwash. They are not even close. The climate is many orders of magnitude more complex than the models. I also noted how they accepted the idea that gas molecules in the atmosphere preferentially radiate LW photons “downward”. But the papers they cite only assert this (absurd) notion, and don’t show any physical reason to support it. Their step analysis of temperature changes are interesting, and they may be on to something here in regard to the discussion of non-linear affects and chaos theory. But these steps may also simply be an artifact of how the “global average temperature” metric is calculated. For me this paper is thought provoking, but also seriously flawed in some ways. Also “Hogwash.” The climate is actually very simple, and quite predictable. Google “Climate Change Deciphered”.for an eye-opener.. Your statement is absurd on the face of it. All you are doing in that blog post is arguing that SO2 changes are responsible for the current warming. Whether that conjecture is true or not has nothing to do with the question of the complexity of the climate. There’s a lot more to it than the current obsession with “global average temperature”. 1. SO2 changes ARE responsible for the current warming. It is not a conjecture. 2. 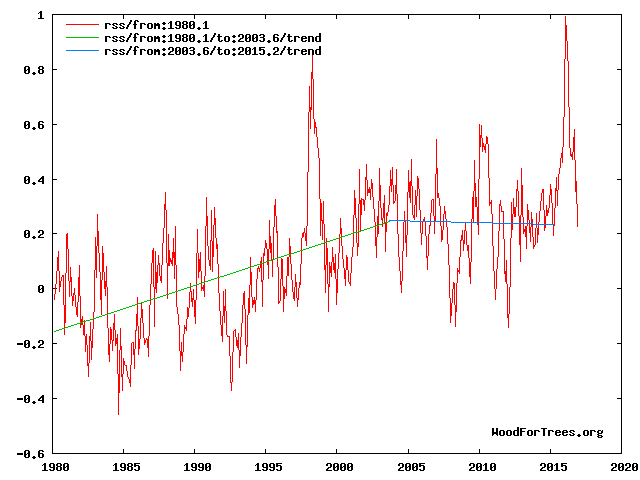 You are confusing Climate (Average Global Temperatures, etc.) which are explainable, with local and regional Weather patterns, which are far more complex. I agree, and also wonder what the trends would be without “corrections” due to sea surface temperatures being altered and infill from very dodgy reporting stations. the author makes the mistake of thinking that because the air over the water quickly takes on the temperature of the water, that this is causing heat to move from the air to the water. however, this is not the effect of warm air. warm air increases the evaporation of the ocean, and this cools the air, because heat is a function of both temperature AND humidity. climate science only measures temperature, which leads to a misleading picture of warming, because it excludes humidity. Bingo! The idea that NOAA and NASA and the EPA and IPCC pontificate about global warming while ignoring the role of humidity is beyond laughable. The public may be mostly ignorant of enthalpy but professional “climate scientists” pretending it doesn’t matter is just ridiculous. I guess it makes smoke roll out of their computers so they treat it like it only exists as a warming agent. JH: You wrote the magic word – enthalpy. Temperature itself is an intensive property and cannot be averaged. Global Average Surface Temperature is nonsense. The only way to do averaging is to use temperature and humidity to calculate enthalpy or energy content, which is an extensive property that can be averaged. Without the worms it would never have been published. I’m a “the glass is half full kinda guy”. Agree with you Janice. Seems to me like a step model for the more vocal CAGW scientists to indicate a pause and step back on their catastrophic predictions in an effort to maintain their reputations and create avenues to seek other lines of study as Climate Change Research becomes a subject of snickers and ridicule at parties for the intelligentsia. If you like it, you might be right. We do not know if the increasing OHC in the oceans really comes from the atmosphere. Underwater volcanoes may also be responsible, since the temperature changes are converted to C or K, only marginal. Far less than the SST differ, which represent the first millimeter (according to satellite measurements). I think that it is not abnormal that there are also quite stable temporal periods in plate tectonics. In Turkey, there is a one-to-one decade, after which Istanbul will be subject in a few years (quite sure with the well-known Turkish construction of the houses). This period is even spatially and temporally noticeable, that means the earthquakes move on a spatial and temporal track. And a well-known temporal period on the longer-term scale is to be noted at the Yellowstone. This map gives at least an impression that also from the deep sea energy entries can go out and that not too tight, because most borders of the continental plates run in the sea. And it would be odd if there were only volcanoes at the plate boundaries over sea level. If one assumes that above ground volcanoes continue also in the sea, there are hundreds or even thousands in the deep sea. We don’t know that ocean heat content is rising, Hans. We simply do not have enough measurements (reliable) to say that definitively. Whenever I see the words “human contribution is xxxx” the first question is how have you separated human from natural. There is never an answer. they don’t have one. When they do try to answer it always boil down to something along the lines of “the models tell us”. As in all good performances of the Magician’s Art – you may have failed to notice that the trick has already taken place….. If I were performing a similar trick, as a stage magician, you would have heard me say something along the lines of: Dear friends, …. You may think I’ll attempt to distract you while fooling you in some way. Rest assured, this is not so….I invite you to watch closely my every move. You may find there is magic after all. The audience’s eyes will follow the scarf, look where the magician points, and look where he looks. I have never had even the most skeptical audience (not even ‘tweenage boys) catch me at this. …. So Janice, is the missing heat in the scarf? Or the hat? It’s in the deck of cards that was swept into the hidden dark well. While we weren’t looking, a new and improved “pause-buster” has been released here from beneath the magician’s coat tails. The mechanism (which may not really exist) is concealed beneath a flurry of hand-waving and woo-woo climatology. This is wrong. 90% of heat has gone into the oceans, but that doesn’t equal 90% of the forcing. Since the radiative imbalance (i.e. the rate of heat uptake by the ocean, ice and land) is about 0.6w/m2, versus 2.3w/m2 of forcing, it follows that about 75% of the forcing has not gone into the ocean/ice/land. (That’s a calculation that assumes no feedbacks that either amplify or reduce the forcing – things would get more complicated with feedbacks). A paper showing this clearly is Murphy 2009. Most heat hasn’t gone into the oceans – it’s been radiated away. That’s why the ocean never toasts us – as soon as the temperature goes up, the Planck feedback kicks in, increasing infrared emissions (i.e. energy loss to space). See their figure 6. They also include a huge figure for heat that presumably has been ‘cancelled’ by aerosols, but that’s mostly speculation. Still, outgoing radiation is quite a bit greater than ocean heating. Also, don’t be fooled by the MISTAKEN refutation of the paper by A whatever whatever just above. That A’s reason (Most heat hasn’t gone into the oceans – it’s been radiated away. That’s why the ocean never toasts us) is bogus does not make the above paper good science. As water warms, the amount of evaporation increases. As a result it is very difficult to “store” energy in water. Climate in terms of decadal changes again. Give me strength. It still looks like a 60-year cycle superimposed on a 1,000-year cycle to me. But what do I know. I just look at pictures and visualize patterns. We do a lot of that in geology. I have one objection to their theory: If atmospheric warming periods are due to oceans dumping heat into the air, shouldn’t the oceans cool during atmospheric warming. And wouldn’t thermal expansion-contraction of the oceans make sea level fall as the air warms? But their tide gauge patterns look so similar to the temperature patterns that I see no sign of the antipathetic behaviour that their model would suggest. But what do I know, I’ve only got high school physics and a skeptical mind. And a PhD in geology. It doesn’t, the earth is going to get hotter and hotter until we all die. I suppose I need /sarc, with some of the humourless commenters we tend to see around here. Bunch of pedants. The oceans store something like 1000 times as much energy as does the air. Even a big warming of the atmosphere would come from a barely measurable decrease in water temperature. Still much to do about nothing. 2 demonstrations for those of us who speak with the believers(CAGW). atmosphere; cut one grain into 10(20? )pieces observe one piece = human contribution of CO2; cook rice and consume – problem solved, demonstrates residence time of CO2. not dying from old age). Unless you are an athlete needing really cold soak, do not bathe. For example one, a few grams of arsenic can kill a fully grown man. Just because there is not much of something is not evidence that it can have little to no affect. For the second example, the air being blown by the hair dryer will cause so much evaporation that the water will cool. CAGW is a bunch of nonsense, however it doesn’t help when our side uses science that is worse than theirs. False analogy, MarkW. Arsenic acts by chemical processes, not physical. And, as you correctly point out, the hair-dryer-bathtub experiment is a false analogy for the ocean in itself. Nothing false about the analogy. The fact that CO2 acts via a physical process means that CO2 would have even more impact. Chemical reactions stop once the initiating agent is consumed. However the act of converting LWIR to thermal energy does not “consume” CO2. Once a molecule of CO2 has captured a photon and transferred that energy to surrounding molecules, it is ready and available to capture another photon and repeat the process. I don’t see why anyone would be surprised about this. N. Atlantic oscillations drive N. Hemisphere’s climate and consequently the global temperature natural variability. It is well known fact that the N. Atlantic SST (and it’s detrended index- AMO) has two principal periodicities of 9 and ~60+ years. In the first graph there are 5 full steps in 1970-2015, making average length of each step coincidental with AMO’s 9 year period. Question is where two periods of 9 and 60+ years come from? 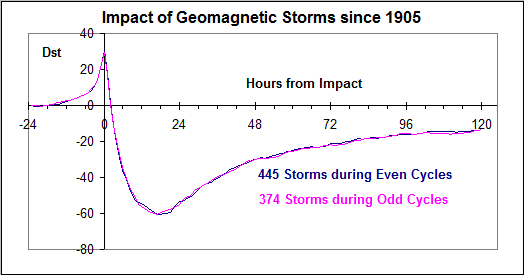 Although the average intensity of geomagnetic storms is the same in both even and odd cycles, there are 374 storms in the odd and 445 storms (or nearly 20% more) in the even cycles since 1905. 1. The limiting of open ocean water and inland lakes to 30 -31C is caused by the inorganic deposition of calcium carbonate, this process has been known for over a century; but, no one understands how the process works. Currently, the limitation of the temperature is attributed to other processes; however, the process is global and appears to be a chemical process. My suspicion is that as water warms to near 30C carbon dioxide is released and reacts with calcium compounds to form calcium carbonate. Sufficient heat is removed to effectively limit the temperature to 31C. This process is present in all bodies of water both fresh and salt except the Persian Gulf, a lake in Southern Russia, and mud flat areas along coastlines. 2. As calcium carbonate in hard forms such as shells or in powder form from chemical reactions fall to the bottom of the Ocean, they are “dissolved” at the Carbonate Compensation Depth CCD. The “dissolving” is generally attributed to weak carbonic acid in the Ocean; however, when a compound dissolves in water it does so by water molecules attaching to the substance and the compound becomes hydrated. Calcium carbonate hydrates in steps generally forming Calcium hexahydrate , although higher hydration is possible. Calcium Carbonate dissolved by carbonic acid is energy favorable to forming calcium hexahydrate and the Calcium hexahydrate forms directly. The forming of the hexahydrate removes up to 75 kilojoules of energy per each mole formed. Calcium hexhydrate is stable only at low temperatures and reverts back to calcium carbonate and water at 4-6C. The energy is released when ocean currents bring the calcium hexahydrate near the surface. the 4-6C temperature is exceeded and additional heat is released warming the Ocean as described above. Bob Tisdale suggested this stepwise heating when studying Ocean temperatures. It’s a casual backhand that my Irish grandfather would have enjoyed tossing into a conversation. If the models are that complex, then they can never be validated or trusted. Their confidence will always be too low for decision making. So, at best, they are useful for designing experiments, more likely academic toys. At least they’ve justified some continued investment in high performance computing. I’ve always said that such models are useful for helping you to figure out what it is that you don’t know. Put all that you know into the model, then compare the model to the real world. Figure out where the model results differ from the real world. Then try to figure out why the model differs from the real world. Once you have that figured out. Put your new understanding into the model. Another thing, stay humble, just because your model happens to match the real world for the period of time being studied, could always be just a coincidence. As some say, “almost” only counts in horseshoes and hand grenades. Except when “almost” means +/- 1000 miles. It will be worse than we thought, it will now be humanity at risk of being trampled by the steps of the anthropogenic climate jackboot. My point is that CAGW believers are not people who understand much of anything unless it is demonstrated in such a manner as to leave them speechless which is what happens(algore movies anyone). It is a relief to read, at long last, a proposal that fits exactly with my own view on climate (especially temperature) time series.which I have held and believed in since discovering it in the early 1990s. The climatologists that I have contacted about my beliefs, and supplied them with graphics evidence for them, have, I have to presume, simply binned my efforts, since I have never had a reply. If you know how to look at data in a manner that does not blindfold you with long-term linear modelling, you will find that almost every single site series contains strong evidence for step changes. Vinther’s S W Greenland data contains a blatant example that he entirely missed and presumably does not wish to know about even after I pointed it out to him. Linear fitting is perfectly good and natural for series that are inherently linear underneath their noise components (what is this noise, by the way? ), but NOT when the series spans a step change. How to spot a step change? Using formal statistical methods it is a bit of a computational bore, especially when insisting on 95% levels of significance, but there is a really simple method long known to SQC people that works perfectly well in practice, otherwise they would not use it. Look up “Cusums” and find out what you’ve missed! Here’s a hint:- look at temperature data for any site in NW Europe, from Brest to Moscow, and Tromso to Lausanne and concentrate on late 1987, or perhaps a little later. That’s when the pause for this part of the world began. Another hint! Averaged data from a wide-ranging geographical area are less likely to display step changes, since these changes are not necessarily simultaneous, and might be displaced from one another by a few months, blurring the sharpness of the change. If you want to know more you’ll have to contact me via email – ask Anthony – and I’ll send you some plots. I can’t put plots on this blog. Cusum is a standard 6sigma quality control technique. It works because a production machine/process in proper calibration will still produce acceptable small random variations. The cumulative error will wander around zero. If it goes out of quality calibration, the cusum will rapidly grow to a large positive or negative number. But this is because the acceptable minor production process error is statistical white noise ( normally distributed per the central limit theorem around a mean of zero). Most climate data, especially temperature data, is autocorrelated so contains red noise rather than white noise. Therefore cusum is unreliable and should not be used. What do you think about multiple climate series by independent observers in the same country (Switzerland) at various levels 2600 m to little above sea level, (ski resorts to summer holiday spots) with accompanying widely different average temperatures? The observers will certainly be professionals, and the data come from Meteo Suisse. /All/ the sites produce cusum plots that are remarkably similar, all with what I choose to call a step change in the autumn of 1987, in essence the same month. Would you expect all the sites to have the same autocorrelation, and thus I suppose inevitably lead to effectively identical red noise? (And effectively identical cusum plots). I find it very strange. Robin, just got back here. In a small country like Switzerland, excepting things like summer thunderstorms the main site temperature difference is going to be the altutude lapse rate. That can be washed out by comparing site anomalies from a universal baseline. The temps or their anomalies are still going to have red noise. Red noise can automatically produces spurious steps. Perhaps autumn 87 is one. Was there some change in reporting (like TOBS in the US)? But I am sure Qusum relies on a white noise assumption for its quality control utility. Had the full 6sigma training at Motorola. Ristvan, Thanks for responding. I appreciate your concern over “red noise” and have done a bit more reading on the subject, as well as some practical tests. First, please note that I /never/ make any mention of forecasting. Trying to use cusum values for that would clearly be nonsense. I write solely about historical data, anywhere from recent months back to the 17th century in some cases. I view a cusum plot as simply a technique for displaying time series in a manner that disguises nothing. It uses all the data, and it can be back-transformed to the original series by simple subtraction sums. There is no smoothing of any type in the primary cusum. I am not fitting a curve, just simply displaying what the observing/reporting scientist released from his research. There can surely be no objection to this. Other plots, whilst displaying the original data, seem to be aimed at devising simplifications and explanations for them. This sort of work is the province over those who are convinced that climate data are inherently cyclic in nature, which may well be the case, or of those whose thinking tends towards identification of potential forcings. Again, this may be a soundly based technique or belief. I don’t know about either of these underlying climate drivers, but I do think that I can detect the effect(s) that they may have. My very general conclusion is that climate observations are prone to very sudden step changes that may give no hint of their imminence. As far as I can see (so far), such things simply happen. And when they do the predictions of the projectionists fall apart. I mentioned my simple findings on temperatures recorded in Switzerland – specifically the ubiquitous step change in late 1987. Such a clear-cut effect cannot be laid at the foot of happenstance or correlated residuals, red or otherwise. It is a highly self-supporting comment on assiduously measured scientific data, collected by independent laboratories or observation posts over a long time period. It just has to be real! I have been adding red noise to the CET monthly data. Even with a noise signal that is comparable in magnitude (standard deviation) to the Std Dev of monthly differences (anomalies?) the form of the cusum of the adulterated series is preserved, with all its major features intact. Can’t simply be the underlying problems of forecasting using cusums, which are real. My advice is not to try to forecast climate time series beyond three or four observations, by which time your mistakes will still be undetectable!. If you wish to spend a relaxed half hour just pick a temperature time series from north west Europe, generate the monthly differences if that’s a simple task, and then the cusum of the new series. Bingo, an obvious sharp angle at a change point (in late 1987), with little if any change since then.
. As external factors slightly change the non-linerar system, it can shift to a new stable-level output. Each of these levels are self-enforcingly stable — thus the stair-step effect. If the system is pushed too hard, it will eventually hit the chaotic realm for that system….but before it gets there, we will see a bifurcation — oscillations between two (or more) values. The Earth climate system may exhibit this chaotic oscillation in what we know as Ice Ages and Interglacials, but it does not appear in the modern temperature of record of the current interglacial. 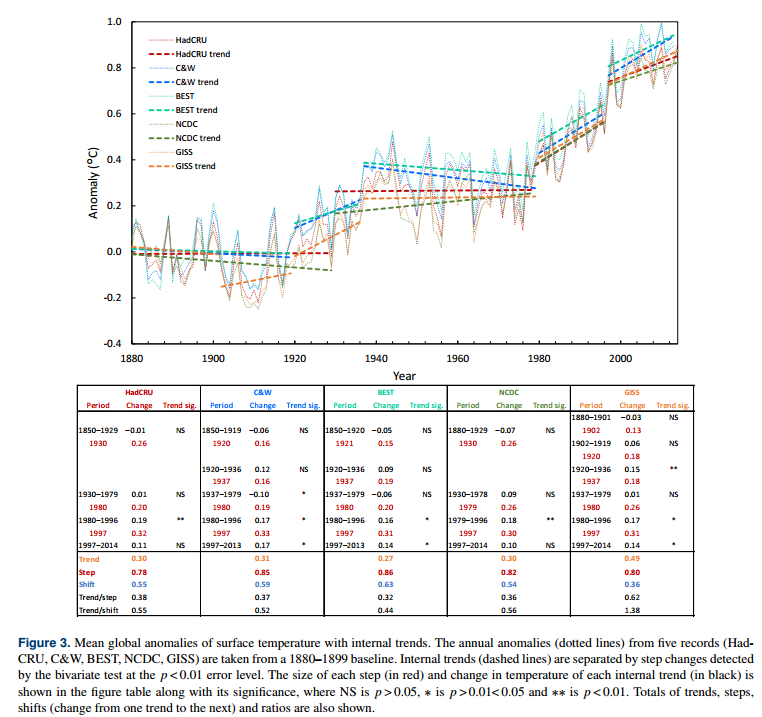 The authors in figure 3 used the highly “tampered” with temperature data that makes early 20th century a warming insignificant relative late 20th century “warming”. Not a statistician but I wonder what effect the non-cooled data would have on their results? The climate steps (especially the 50 year ones) are very clear in this study, that used CET, which allows us to go back hundreds of years. These steps were observed by scientists of the past as well, so whilst this recent study may update our knowledge it is not telling us anything new. Incidentally, my own reconstruction back to 1538 from the official 1650, illustrates an intriguing step up again, after the step downs we can observe that heralded the intermittent little ice age. Tonyb, the climate regime steps in your analysis of CET on order of multidecades are believable. The more numerous shorter steps illustrated above are statistically dubious. See my longer comment below. Here is what’s really going on. We are just past a millennial and 60 year natural ( solar activity driven ) temperature peak. The RSS cooling trend in Fig. 4 (above) was truncated at 2015.3 , because it makes no sense to start or end the analysis of a time series in the middle of major ENSO events which create ephemeral deviations from the longer term trends. By the end of 2016, the strong El Nino temperature anomaly had declined rapidly. The cooling trend is likely to be fully restored by the end of 2019. The temperature inflexion point at 2004 corresponds with a 12 year +/- lag to the Solar activity high ( Neutron low) at 1991. 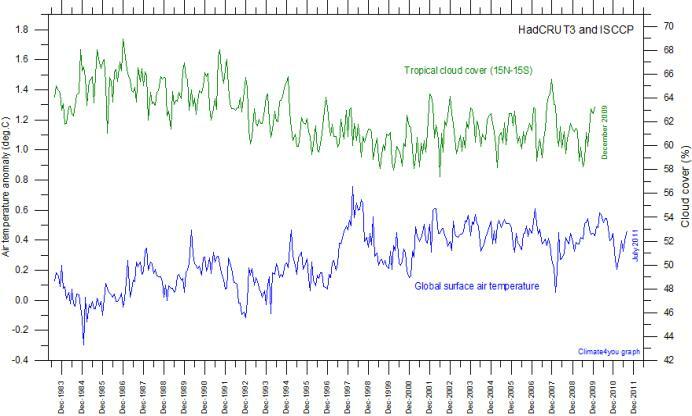 The same inflexion point is also seen in the global temperature and tropical cloud cover data. About 50% of months are either ENSO + or -. This provides so much noise that it is easy to visualize steps. Unskeptical Science used this noise to create their silly stepladder. Hence, anyone can manufacture steps to their hearts content. It doesn’t mean anything. I think Bill Illis corrects the data for ENSO and gets a much smoother curve with a slight warming trend of about .04 C / decade. Sorry but I just don’t see anything useful here. I am a pH.D level econometrician, and do not think very highly of this paper’s findings. Temperature times series are autocorrelated. That means the error ‘noise’ around the true ‘signal’ is red noise, not white noise. This means that spurious ‘steps’ will be automatically be found by most step detection methods that do not exist in reality. This is not new news. For a fuller discussion specific to climate, see Radionov, ‘The Problem of Red Noise in Climate Regime Shift Detection’ at http://www.beringclimate.noaa.gov. I sought a specific pertinent reference, took about 20 minutes to find using google-fu. This is also a major problem in econometrics on matters like persistent unemployment, inflation, and capital investment. Easy to generate pseudosteps from autocorrelated economic data with red noise that do not at all reflect the underlying systemic drivers. Learned that long ago at university. Incidentally, this same red noise property is why Mann’s centered principal components technique automatically generates hockey sticks from red noise paleoproxies. See the McIntyre and McKittrick( who is an econometrician) paper for details. ristvan ==> Before passing judgement, you should read the full paper (which I assume you have done) AND the review materials and the discussion for the paper available from this page. Radionov is fully covered and accounted for. This is a very serious paper and very important for the advancement of climate science in general. I hear that we will be seeing a technical piece on this at Climate Etc. sometime soonish. To dismiss this paper and its implications for the larger field of climate dynamics would be a huge mistake. Kip, I think not. Went back and double checked both the methods section and all the footnotes. Nowhere is Radionov mentioned. Which means their statistical methods section is faulty for the reason stated that Radionov treats with mathematical detail. ristvan ==> Rodionov is taken into account in the final paper, specifically mentioned in the text and referenced twice. Same for the original discussion paper. In the Author’s Comments (response) to reviewers, Jones states they use the “Rodionov test”. I refer to McIntyre and McKittricks peer reviewed paper, which despite several efforts has never been properly refuted. Not only was it refuted in the the link I provided (which you may not like because it was a “comment”) it was “properly” refuted here: http://link.springer.com/article/10.1007%2Fs10584-006-9105-7 The problem that your criticism has is that there are a wealth of subsequent studies that have confirmed Mann’s initial findings. So, you’d best stop focusing on Mann’s work, and focus instead on the fact that many different reconstructions, using data from many different sources and proxies, all show the same thing. Ristvan, in science its called “reproducible,” the hallmark of scientific fact. No valid science has confirmed Mann’s HS. It’s a complete and total fr@ud and statistical nonsense. Gloateus, got something better than a blog post? The valid studies don’t say what you claim they do. The borehole paper says it takes a century for surface temps to affect the boreholes, but finds that over the past 500 years, there has been a 1.1 K rise in the NH and 0.8 K rise in the SH. Since earth has been coming out of the depths of the LIA for the past ~320 years, this finding supports man-made global warming, how exactly? Yes. It links to Climate Audit’s refutation of Mann’s lies and drivel. Gloateus, I provided you with a list of over 30 subsequent papers that confirm Mann’s work. You comment about a borehole in one of the studies. First of all, if you want to refute a paper, please cite the paper that refutes it……your “comment” isn’t worth much in the world of science, unless it’s published in some reputable publication. Even if I concur with your borehole objection, you now have 29 more papers to refute…… I’ll gladly wait for them. PS…..citing “Climate Audit” doesn’t mean much, as I’m pretty sure it’s not peer-reviewed. Also Gloateus, you say: “Since earth has been coming out of the depths of the LIA for the past ~320 years”….do you have an explanation why this is happening? You know, like a physical, measurable reason this has happened? SH, you avoid the core Mann criticism because there is no legitimate response. MHB 99 is thoroughly illegitimate. You segue to its ‘replication’ and cite Pages2k. Your problem is that those ‘replications’ suffer many of the same technical problems as Mann. McIntyre has been tireless in exposing these across many posts. Upside down Tiljander in Pages2k, for gosh sakes. Most greviousmwas the ‘newest’ Gergis contribution, after themoriginal was withdrawn before publication after a single simple SM comment. If Gergis is the level of paleoclimate sausage making you find acceptible, begone. Because you then agree effect precedes cause. Not in my world. Oh, and your ‘not peer reviewed’ classical warmunist objection is priceless in light of Climategate. Objective facts are easily ascertainable independent of pal review. Not like in the old ivory tower days. Wrote a whole book about that published in 2012, The Arts of Truth. You would benefit from reading it. Hundreds of examples in multiple theme catagories like education, health care, energy before getting to the culminating climate change chapter critiqued by Lindzen himself at MIT weeks before he retired. Ristvan, please point me to the paper that refutes pages2K. Mann 2008 addressed MM05. If you sources of refutation are blogs, please stop making me laugh. I provided a list of over 35 papers which confirm Mann’s original work. You cite a blog. Then you cite stolen emails. Then you cite a book. Do you actually have clue about science is actually done? Steven Heins, you are relying on the classic “appeal to authority” fallacy, going on who said a given argument rather than the actual evidence. I have encountered defenses of Mann online, and so far none of the articles cited addressed the McIntyre or McKittrick objections as to method. If one repeats Mann’s technique, apparently one gets the same sort of result. The dispute is over the technique. Tom Halla, Mann used the PCA technique ( https://en.wikipedia.org/wiki/Principal_component_analysis ) which has been around since about 1900. What are your objections to this analytical methodology ? PS Tom Halla, how do you address over 30+ subsequent studies that have confirmed Mann’s original work? As I told you, that list doesn’t say what you claim. Obviously, you haven’t read those papers. Climate Audit doesn’t need to be peer reviewed. When you’re right, you’re right. Facts matter. In corrupt “climate science”, there is pal review, as shown by the Climategate emails, a fact already evident to all who were paying attention. No legitimate science has ever reproduced Piltdown Mann’s HS. It’s a complete fabrication, without a shred of physical reality. No wonder the little dweeb is fighting tooth and nail to hide his UVA emails and to stay out of court with Steyn. No one and nothing has ever confirmed the HS. It’s a lie hiding not only the decline but objective reality. Mann hasn’t even admitted to turning data upside down and ignoring numerous trees to focus on one outlier on the Yamal Peninsula. ” Climate Audit doesn’t need to be peer reviewed” Well if that is true, then Climate Audit isn’t science. How do we know if what is published on Climate Audit is factual? A court case involving defamation has no bearing on the 30+ papers that have confirmed Mann’s work. How come there are no paleoclimate reconstructions in the literature that show Mann’s work to be incorrect? Your citing stolen emails shows nothing, considering that all of the investigations into said emails have proven nothing outside of the fact that the emails were stolen. Oh….and the court case with Steyn is about defamation, not with paleoclimate reconstructions. Your defense of Mann is still irrelevant. So Mann has followers among the warmists? None of this addresses McIntyre and McKittrick’s challenge to his work. You keep parroting that the HS has been confirmed, but the 30 papers which you cite don’t confirm any such thing. As I said, obviously you haven’t read them. Peer review isn’t the basis of science. The scientific method is. CACA is not science because it doesn’t rely on the time-tested and true scientific method. It was born falsified, so is not science. Climate Audit is science because it has never been falsified. Clearly, you have never taken even an undergrad class in the philosophy of science. You ought to be embarrassed for saying “Climate Audit is science because it has never been falsified.” Why? because the blog that posits “ancient aliens” ( http://ancient-aliens-were-here.blogspot.bg/ ) hasn’t been falsified either. Don’t talk to me about the philosophy of science, when you can’t even pass a basic logic class. That was a singularly obscure abstract. I do remember what the objections to Mann were, and the abstract dealt with none of them. Pray tell, does the paywalled article deal with red noise or grafting instrumental data onto proxies data, or the claim that Mann’s program will come up with a hockey stick overall if any of the data is a hockey stick? PS Gloateus, In line with your logic, the statement “God exists” has never been falsified. Does that make it science? Tom Halla, Mann’s work has been confirmed in many other papers (see https://wattsupwiththat.com/2017/03/31/a-ground-breaking-new-paper-putting-climate-models-to-the-test-yields-an-unexpected-result-steps-and-pauses-in-the-climate-signal/comment-page-1/#comment-2465969 ) Many of these papers used different methods, and different proxies, but they all supported the conclusions Mann reached. I thought you didn’t read the actual article. Your response tends to prove that assumption. Clearly, you didn’t read them. I showed you one which doesn’t say what you claim. Far from it. 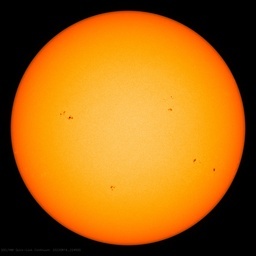 The LIA was caused by three or four solar minima. We haven’t had one in the Modern Warm Period. Human activity isn’t a pimple on the posterior of climate change. Can you really possibly be so ignorant of elementary scientific method philosophy as not to understand that to be scientific, an hypothesis must make testable, falsifiable hypotheses? The God hypothesis cannot make falsifiable predictions, so is not scientific. Neither is CACA. It not only doesn’t make falsifiable predictions, but was born already falsified. The cult of CACA has less going for it scientifically than does the God hypothesis. If as you say the LIA was caused by a lack of solar activity, please explain why global temps rise without rising solar activity? There is no “CACA” hypothesis to falsify, because it’s a strawman you’ve presented. The AGW hypothesis was made in 1896, and has not been falsified. In fact the calculations resulting from it are pretty much right on the money. Now because Climate Audit is a blog, and is nothing more than someone writing his “opinion”….guess what….it’s not falsifiable, so your claim that it is science is funny. “Human activity isn’t a pimple on the posterior of climate change.” Unfortunately UHI is more than a “pimple.” That doesn’t even factor in large areas of land use changes, such as de-forestation. Well blow me down with a feather – does this mean that the coupled chaotic non system linear linear is actually behaving in a chaotic linear coupled non system linear manner? I’m may still be struggling with what its non-linearly chaotically coupled to, but this looks like progress. What a gift of wonders Climate Science is……….. Pretty damned impressive if they can turn a chaotic process into endless grant money. To Hell with Chaos Theory! I wonder if they factored in the NOAA & NASA “adjustments” like TOD and Hansen’s cooling of 1900-1950 to make the warming look more ominous? Can I remind everyone that Zeke let the cat out of the bag when trying to prove that you could not just plot average Temperatures as Tony Heller does in this WUWT Post, Anthony did not agree with what Heller had done, but RAW DATA speaks for itself. 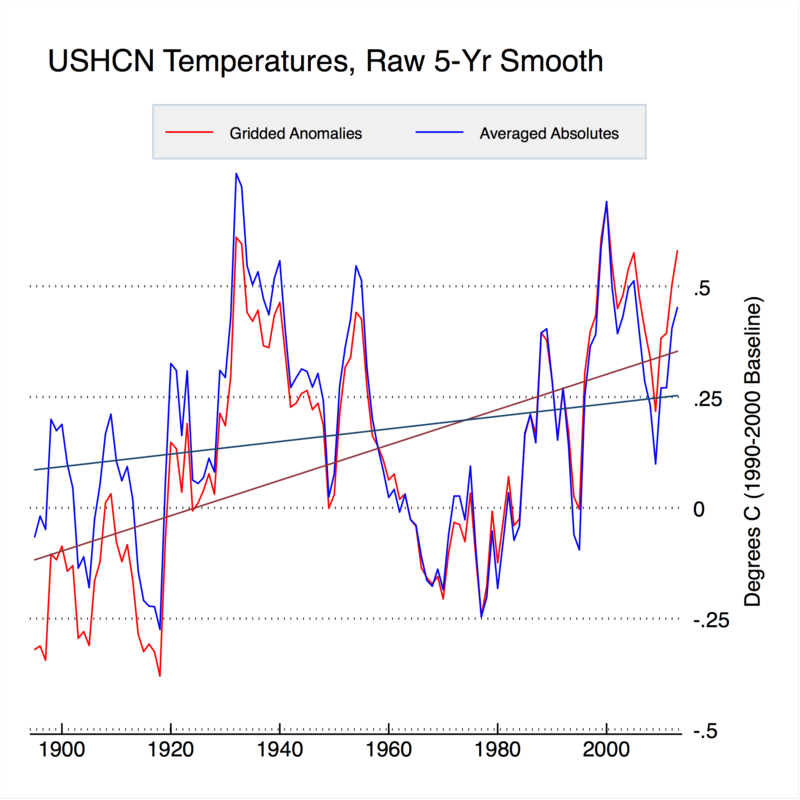 It is obvious from both of these graphs of raw data that the Temperature rises very quickly and then falls more slowly. That data looks like our history of Temperature data shown to us before the 1980s and is nothing like the smooth progressive rise in Temperatures that is currently being achieved by the “Quality Controlled”, “Adjusted” and “Homogenised” data that is currently produced by the various Climate Authorities, which is being produced to try and make it trend along with CO2. Aha! It goes up in steps! How is this reassuring for sceptics? The take home is still “it goes up”. Skeptical Sci. I believe actually said such a thing about ‘the steps’. In discussing Tisdale’s going up in steps, I asked the obvious: well, does it go up in steps forever or does it start to step down at some point? Don’t get too excited that it isn’t simply linear with GHG. It would be argued by the faithful that the step process operates however the climate might be warmed. “So we have some gross quantum like process operating” . So what? This may be a way to make skeptics happy with the warming. Reading the comments it would seem to be a winning strategy. Gold medal goes to Janice Moore on this one. Mainly because you’re more interested in winning an argument than climate science. I have mentioned upward and downward stepping many times in the past and pointed out that such phenomena follow from the ever changing interaction between solar variability and ocean oscillations. One would see upward stepping during periods of solar induced warming and downward stepping during periods of solar induced cooling as the changing net effect of ocean oscillations works on the solar signal. The solar signal being caused by the sun affecting the gradient of tropopause height between equator and poles such that jet stream behaviour changes and in turn affects global cloudiness which alters the proportion of solar energy able to enter the oceans. This new paper simply validates my earlier diagnoses. 1 – the temperature is going up due to greenhouse gasses. 2 – but you can’t see the signal in the atmosphere because of magic. 3 – the heat hides in the ocean and come out occasionally when we least expect it. 4 – so we should still be very afraid and continue paying taxes to the climate scientists. No climate scientists involved in this paper. It’s an economist and his student. All kinds of academics and strap-hangers have hopped on the “climate science” gravy train. Many of the most famous “climate scientists” are not climatologists or even scientists, but mathematicians or computer programmers. Oreskes is an historian. Cook is a cartoonist. Thanks Nick. Are they cheaper than climate scientists ? Are they better at math? The supply always meets the demand. I don’t think they are better at math. But how much climate money was involved in commissioning the paper? Why would they write a paper like this unless they thought it good for their careers? The more money and status climate research gets the more junk science seems to come from that direction. 1a – our climate models are so complex that they should not be compared to reality but must be assessed by comparison with other and simpler models which show our models work. 3a – our findings are evidenced by use of our climate models. And all that out of a load of FABRICATED and manically ADJUSTED non-data. Quite bizarre , really !! Sort of like most AGW scam papers.. no REAL scientists involved. The stair-stepping of temperature likely results from resonate gravitational perturbations that stimulate Earth internal heat release. And the greening of the earth is a result of more plant food, ie CO2, in the air, regardless of source. It’s a good thing, and more is better up to the level in commercial greenhouses, ie ~1300 ppm. CO2: food for photosynthesizers since 3.5 billion BC! The first photosynthetic organisms had an immeasurably greater effect on earth’s climate, atmosphere, lithosphere, hydrosphere and biosphere than humans have done and probably ever will do. The evolution of photosynthesis is easily one of the Top Ten most important events in the history of life on earth. Maybe Top Five. It freed autotrophs to invade previously inhospitable environments. And where the autotrophs led, we heterotrophs were sure to follow. And yet CACA acolytes think more photosynthesis on land is a bad thing. I dont know if the paper has a very different point of view than Trenberth. The heat that comes out of the ocean to haunt us. Its been shown in UHI studies that the Air advected from a city remains warmer despite the fact that the surface is rural. It takes more than 300meters to adjust to the underlying surface. The BEST you can do is think UHI is insignificant…So what difference can 300 meters make. Please be consistent in your proffered delusions. I don’t see why climate scientists would object to this. Their statements about linear trend was just mathematical. They never claimed temperatures would go up every year. The author’s affiliation suggests economics, as pointed out in comments. But he seems to have missed a large economics literature on change point analysis. P Perron, Boston University, has numerous papers applying his own and others’ change point methods originally developed for econometrics to climate analysis (of the hysterical tendency). Methods designed to take account of autocorrelation in particular. The thesis of the paper, about the way temperatures evolve, may be right, but the methods seem poor. Should fit right in with the rest of climate “science” then. If it’s bad enough, Michael Mann has probably used it already anyway. The authors might be right, despite relying upon such worse than worthless, cooked book, adjusted beyond all recognition, science fantasy “data sets” as HadCRU, BEST, GISS, etc. This is an early April 1st joke, right? Data from before say, 1970, 1980, etc. with any validity? Ocean heat content. WHO ARE THESE FOLKS THINKING THEY CAN FOOL. Obviously, any IDIOT who had no concept of technological history. These graphs are WORTHLESS. Have no validity. Needless to say, this fabricated report also tells the usual lies about the poor polar bears going extinct as the Airctic melts away beneath their paws…. I want to know where the energy stored in the ocean comes from when the energy that leaves the atmosphere is balanced against the energy that is received. Supposedly we were balanced before greenhouse magic started and all planets in the universe have balanced energy budgets but for some reason greenhouse gasses cause energy to be unbalanced, shoot extra photons at earth and never cool the things that the photons come from despite ample evidence that demonstrates this to be utterly false. (See Trenberth charts that show down welling radiation but never up welling which should actually be larger according to science (smaller horizon and atmospheric thinning). Any theory that doesn’t balance incoming and out going energy defies established science – period. You can change the atmosphere container (CO2) which could cause that minute part of the atmosphere to have a different gradient but you can’t change the energy stored in oceans as their thermal properties remain the same. You can change the temperature gradient of the atmosphere but you can not store energy that doesn’t exist unless we get closer to the sun (more energy). These are scientific facts that have never been disproven and modelers are careful to reiterate that there is a balance at TOA but still insist that extra energy is somehow being stored. It’s twilight zone. Would I be right in guessing that they went to the raw data, not the “homogenised” NOAA fraud? I don’t see how you could do any science with made up data. Ristvan, I’ve thought a bit more about your comment on my contribution, in particular the comment regarding “red noise”. So far I’ve not been able to see the relevance of the “noise” in the context of what I do. The huge autocorrelation of cusums naturally rules them out as a method for producing projections of future behaviour of the underlying series. I have no interest in or intention of guessing the future of climate, or anything for that matter, (except for the trivial such as where I live I expect to be warmer in June than in February). My belief is that it is an impossibility, and thus of no theoretical or practical importance. However, the cusum plot is simply another presentation of the historical data. It adds nothing. It disguises nothing, and it is immediately back-transferable to the original data set. To repeat, nothing added, nothing taken away. As such it is quite simply an alternative presentation that responds to general properties of the series. No other presentation of data of this sort includes all the original information, apart from a complete scatterplot. I value cusum plots as giving an almost instant insight into the general behaviour of climate time series. Scatterplots of climate data really do look a mess. Have you plotted the CET data?, which runs from 1659 to the present. It contains numerous peculiarities and it is virtually impossible to make sensible comments without resorting to smoothing of some sort. The second most severe smoothing is by fitting a straight line to the data – usually of the revered least squares type, which is simple and well understood by many though not all those who use it. The CET data produces a “trend” or slope of about 0.00266 deg C per year, with an effectively 100% certainty of not occurring by chance. But as a predictive technique for estimating next year’s average temperature it is effectively useless, despite the certainty that a trend exists. The cause of this is the (unspecified) noise and lack of fit. But of course, no-one would attempt to use it for practical prognostications of future CET values. Other smoothings will reveal a bit more about how the data have behaved, but inevitably discard huge quantities of detail and are equally unfit for making prognostications. The cusum plot of CET data, on the other hand, is honest, disguising nothing. Its wanderings actually mean something. Periods of unusual cold or warmth are plain to see, sections of stable temperatures (apart from short-term excursions) are obvious, and the whole invites further investigation especially if meta data for the periods of particular interest are available. One can also produce the residuals from the aforesaid linear fit and produce a cusum from them. The gross U or V shape of the CET data (due to the overall increase with time) now disappears, but the detail of the original remains, often enabling some points of rapid change to be more readily identified. These plots – which I repeat are back-transferrable to the original data – enable periods of stability to be identified, as well as short periods of very rapid change. Vinther’s S W Greenland data provide an interesting exercise for someone who wishes to follow this sort of thing in more detail. In my opinion, fittings (by least squares) of segments that cover smoothly curving or roughly linear segments of cusum plots have a valuable information content. The precise choices of the boundaries of these segments is not especially important from a numerical aspect. In practice they seem to be reasonably obvious. Summarising, I regard cusums as an invaluable tool for unravelling complex climate systems, revealing as they do regions of particular interest for detailed further analysis. I hope that you can find time to comment on the above. Why is this result unexpected? Where do climate scientists state atmospheric changes are linear and the oceans don’t play a part in the climate system? Where so climate scientists state how oceans play a part in the climate system? Ocean oscillations show cooling not warming. Warming nearly all comes from the sun with a small bit coming from the release of heat from the core (caused by radioactive decay). Warming is a smooth process. After the ocean has released heat to the atmosphere, it heat is lost to space. That’s called cooling not warming. Heat released can not be retained by the atmosphere. In theory, it’s release to space can be slowed down more by GHG. This is what climate catastrophe scientists are supposed to prove: in reality GHG does slows down heat loss. Hardly any research seems to point to that. Climate catastrophe scientists seem particularly reluctant to do any such research. Why’s that? This is not a serious science paper, like about 97% of the rest of warmist junk science papers. It’s junk because the attribution of step changes is misplaced, not just that, but it has no discussion at all of the solar cycle influence. The temperature steps and pauses resulted from solar variation, TSI changes, that provided a net increase in energy to the ocean during cycles 21-24, up to the peak of the solar modern maximum in 2003-4, boosted again by the SC24 TSI max, now over. Climate ‘scientists’ continually demonstrate that they do not understand fundamental processes.